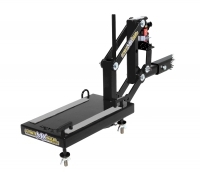 Buy the Ultimate MX Hauler and get Free Shipping! The Ultimate MX Hauler is an innovative hitch mounted motorcycle carrier. The hitch mount means no more truck ramps, borrowing your friends truck, or towing a trailer when all you want is to go for a ride. 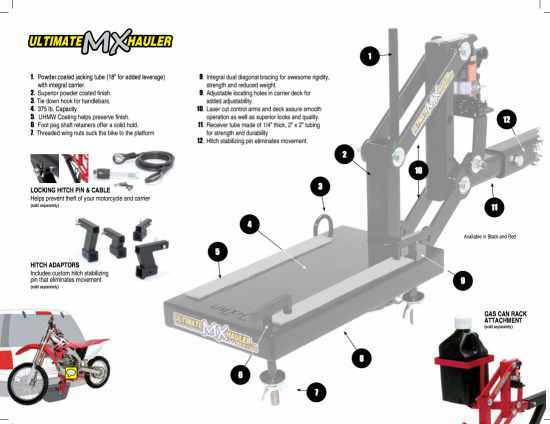 The MX hauler lowers for easy loading of the motorcycle. With a few pumps on the lift, the bike is raised off the ground and ready to tow. The carrier has a 375 pound capacity and has been loaded tested to over 4000 lb. When you're not hauling your bike, the Ultimate MX Hauler doubles as a dirt bike or motorcycle workstand. Your bike is securely held in place by mounting brackets that rigidly hold the foot pegs or the frame.